Latching compact relay with magnetic hold - 3 CO contacts with 2 directions and single cut-off - 3 A. Directly solderable on PCB or pluggable on socket. Pins at the standard pitch of 2.54 mm. 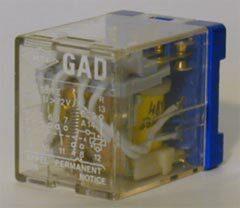 GAD relay is pluggable on the following sockets : EVB/GE, 9877, EVC/GE, 9876, ER/GE 2.8, or ER/GE. * EDF : qualified according to specification 45S27 and test of resistance to seisms (K3 qualification is obtained only when the relay is tested with the equipment on which it is mounted).